Around the world and in the media, people are still reaching out to help clean up the aftermath of Typhoon Haiyan, that devastated much of the Philippines. With an estimated 11.8 million people affected, and 995,000 survivors displaced, Typhoon Haiyan, is one of the most powerful storms ever recorded. Work for All is joining the thousands of organizations around the world to help those whose lives have been torn apart. Through the UNDP, we are making efforts to clean the debris and help in the reconstruction and provision of urgent needs such as food, water and sanitation. 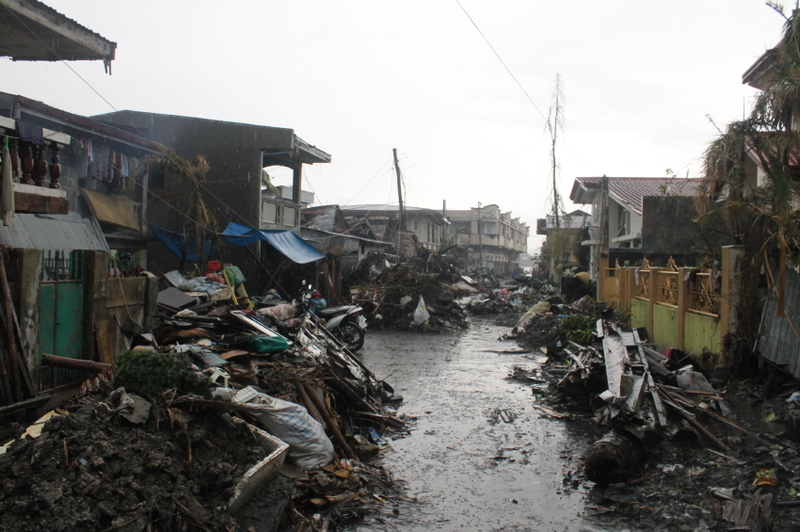 Cleaning the debris is a first and vital step to reducing threats to life and health, caused by unsafe and unsanitary conditions. We would like to emphasize that Work for All is contributing to this cause in addition to our regular efforts around the world. As well as contributing to work in the Philippines, we are increasing our influence in other work around the world. It is important, especially with the media putting such an emphasis on the need in the Philippines, that we do not forget about the other populations which are still very much in need. At Work for All, two of the major companies that support our organization, work specifically with water, industrially. With this ability, we have directed some of our efforts towards improving water and sanitation conditions around the world. We have recently increased our donations to WaterCan to support their work in Ethiopia. There, we are contributing to the production of hand pump wells, spring-developments and latrines for primary schools. Clean water is a necessity for good health and therefore, for development and eradication of systemic poverty. One solution to systemic poverty is making poverty profitable to solve. When you donate to any charity, you receive a sense of doing something more, of being a good person, or of contributing towards a cause greater than yourself. Some charities will give you a t-shirt or a bracelet, or even an ongoing relationship with an impoverished child. These are all good things to receive and be proud of, but what if it was financially profitable to contribute? What if whenever I donated $50 towards Work for All, I got $55 back? I suppose a lot more people would be donating their $50. But, how could I make that extra five bucks? If I could answer this completely, I could change the world. We are not as far from this as people may think. There are some charities, such as Acumen and Kiva, who are doing this through their process of offering financing to impoverished people, who are unable to receive a loan in their own countries. These loans vary from $300, for books for a college student; to $1300 for the purchase of fertilizers for a small farm; to larger amounts for the building and operating of sanitation businesses in slum areas. Like any bank, Acumen and Kiva expect each individual or business to pay the loan back with interest; hence they make a profit. For now these profits are small and anything returned to these charities is put back into new investments. These investments also tend to be high risk. Not to mention the cost associated with operating such organizations. However, these specific organizations have both been very successful in their efforts. This is just one approach and, for now, the profit margins that exist for investments in third world countries tend to be smaller and high risk. But with careful research and the right structure, it is definitely possible to expand this approach and make it functional and effective to use; enabling people and businesses to do more than simply “turn a profit”. At Work for All, we are exploring sustainable business opportunities in the developing world. We think tapping into the billion plus developing consumers by offering products that they can afford and will want to purchase will stimulate sustainable economic growth.